T: (02) 678 1114 ? Despite the drunken-backpacker Khao San Road cliche, real beer can be hard to find in Bangkok. There are a few places worth checking out, including House of Beers and BeerVault, but brewpubs aren’t common. Enter one of our favourite beginnings to an evening: Tawandang German Brewery. Your faithful attendants, keeping your mug full and your beer tower properly aligned. 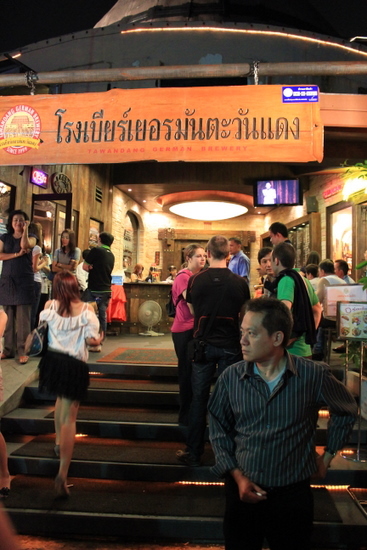 Tawandang is a brewery only as Thailand could imagine it, and about as German as a plate of pad see ew. Big copper pots? Check. Towers of beer? Check. Beer drinking contests on stage? You know it. Thai pop acts? At jet-engine volume. Lady Gaga performed by an orchestra? It’s fantastic fun. The beer is good as well. If you’ve just arrived in Asia you probably aren’t tired of watery Southeast Asian brews yet, but Tawandang does a great job pumping out lager, hefeweizen, and Munich-style beers. The food at Tawandang pairs well with a night of drinking, having been chosen to go along with massive amounts of beer. Do not miss the fried semi-dried pork. Even a brewery sign looks classy in Thai. On Friday and Saturday evenings a reservation is advised. There is usually someone who speaks English who will take your name and time of reservation and give you a reservation number. When you arrive, use the number to find your table from the massive reservations chalk board by the entrance (listed by name as well, although sometimes the misspellings can make the process a bit mystifying.) The staff will whisk you to your table and make sure you are well supplied. 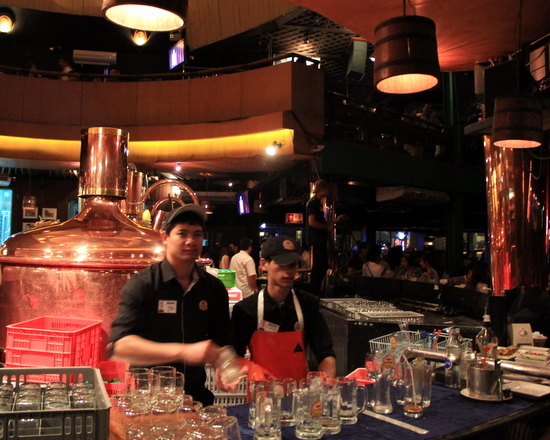 Three-litre towers of beer run around 650 baht, and plates of food are 100 to 350 baht. This is definitely beer hall, Thai-style: get a bit sloppy, and everyone is going to want to be your friend. Just make sure you are singing along with everyone else, even if you have no idea what the words are. It’s just better that way.